Home » About Us » Our Physicians » Robert M. Lombardi, M.D. After graduating from J.P. Stevens High School in Edison, New Jersey, Dr. Robert Lombardi received his undergraduate degree from Rutgers College in New Jersey, and then attended medical school at the University of Medicine and Dentistry of New Jersey. He earned his Medical Degree through Rutgers Medical School where he remained to serve both his internship and Orthopaedic Surgery residency. Dr. Lombardi pursued further training with a special fellowship in hand Surgery at the world-renowned Mayo Clinic in Minnesota. He later received Board Certification for added qualification in surgery of the hand. 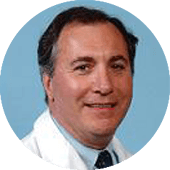 Dr. Lombardi is a hand and shoulder surgeon with 30 years of experience. He holds a special interest in carpal tunnel syndrome, closely following the latest advances in nearly scar-free surgical correction techniques. He is a member of the American Board of Orthopaedic Surgery, American Medical Association, and New Jersey Orthopaedic Society.